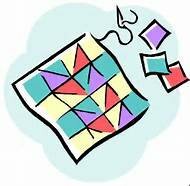 Everyone will make a unique quilt with lots of help from other students and the teacher. Start with a special block, a panel or a group of blocks you made and have not known what to do with. Each month we will spend time on each person’s project, making suggestions about design and fabric. No sewing in class, but lots of camaraderie and fun. This class meets once a month for four months. For first class bring something you want to work with or just come to see examples from previous classes.